Joanne Mott, Somewhere Under The Rainbow. LED solar powered lights, steel, 120 x 200 x 200cm. Courtesy: the artist and MARS Gallery, Windsor. Somewhere Under the Rainbow is an interactive sculpture that reflects both concern and optimism about our collective responsibility for how we consume energy in these current times. A series of seven solar-powered luminescent arches invite exploration. 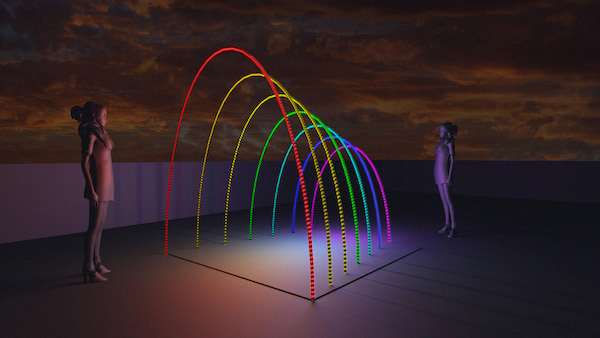 As we enter the rainbow, however, the consecutive arches become successively smaller in scale, to the point where most will have to bend over to get through. We have lived so long without making adequate changes to our energy consumption behaviour, to make it through this critical period in history into a sustainable future requires us to change our posture.